3000 miles north & back: Make your own trail mix. Make your own trail mix. 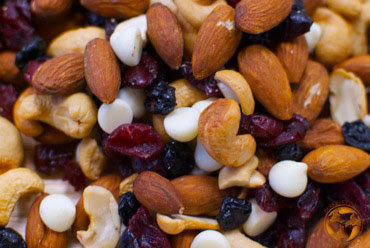 Trail mix is super popular these days and goes way beyond the basic peanuts, raisins and M&Ms. From sweet to savory, there are hundreds of combinations that can appeal to anyone...especially anyone craving a snack. I often bring trail mix with me when I go hiking or camping and especially love the varieties that combine sweet and savory. According to legend (from Hadley Fruit Orchards), in 1968, trail mix was to be eaten while hiking or doing another strenuous activity. It is lightweight, portable and is full of energy dense ingredients like dried fruit, nuts and chocolate (and can pack a hefty caloric punch when not used appropriately). These pint-sized nutritional dynamos are loaded with healthy unsaturated fats, protein, fiber, antioxidants, vitamin E and other essential vitamins and minerals. Healthy favorites: Almonds, pistachios, cashews, peanuts, and walnuts. 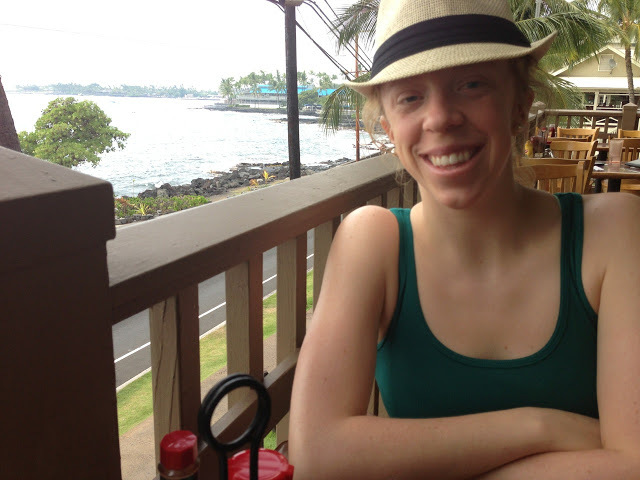 Higher-calorie macadamia nuts, hazelnuts, Brazil nuts, pecans, and pine nuts are also good options in moderation. For those with nut allergies (or just looking to mix things up), seeds provide many of the same nutritional benefits as nuts. Healthy favorites: pumpkin, sunflower, sesame, flax or hemp seeds in trail mix for an extra boost of nutrients. This sugary treat can easily become a danger food, so pay attention to the ingredient list and serving sizes. In moderation, dried fruit can be a great source of fiber, antioxidants, calcium and vitamins A, C, and K.
Look for dried fruit options with as little added sugar and preservatives as possible (some varieties, like cranberries, are naturally quite tart and almost always sweetened with cane sugar or apple juice). 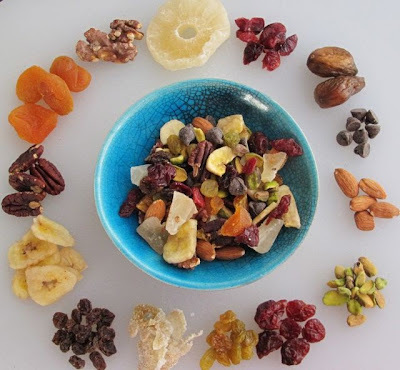 Healthy favorites: Dried apples, cherries, cranberries, goji berries, blueberries, strawberries, apricots, raisins, banana chips, figs, pineapple chunks, mango, and dates. Choose whole grains whenever possible and avoid highly processed cereals that add unnecessary sugar and sodium. Healthy favorites: Shredded wheat cereal, pretzels, toasted oats, puffed rice cereal and air-popped popcorn can all add a little bit of crunch. Sometimes we all need a little something sweet to round out the mix. Just remember to add treat-like options sparingly (unless you’re making dessert instead of a snack). Favorites: M&Ms, chips of various kinds (chocolate, peanut butter, carob, butterscotch), cacao nibs, yogurt-covered raisins, chocolate-covered coffee beans, mini marshmallows, or chocolate-covered nuts. When going the chocolate route, dark varieties add extra antioxidants. Adding spices is a great way to change up the flavor - season the mix with sea salt, curry, ground ginger, cinnamon, nutmeg, cardamom, or cayenne pepper. Also try wasabi peas, coconut flakes, dried ginger and dark chocolate covered coffee beans. I hope this gives you some ideas for experimenting with trail mix on your own. A weekend in Homer and Kachemak Bay State Park.